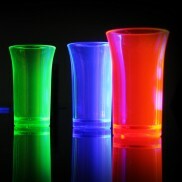 Create an unforgettable party atmosphere with colourful drinks! 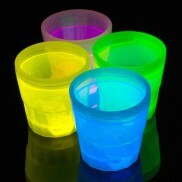 Flashing Rainbow Cups illuminate in brilliant colour for disco lighting in the palm of your hand. 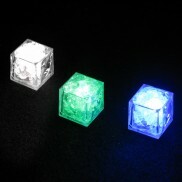 Fantastic fun, LED cups are great for parties. 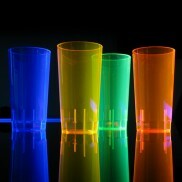 Light up your drinks in fantastic strobing colour with the Flashing Coke Glass. 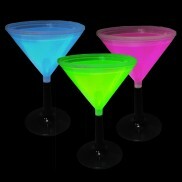 Brilliant for offering to guests or simply for enjoying on your own, they'll add a little disco to your drinks. 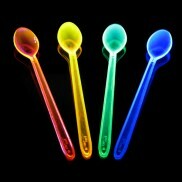 Just the thing for drinks and dessert these fabulous UV reactive Sundae Spoons come in fluorescent colours that glow brightly under UV light which also makes them excellent drinks stirrers for parties. 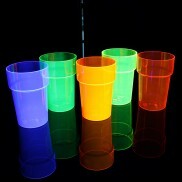 UV Reactive High Ball Glasses - reuseable and colourful plastic hi-ball cups that glow brightly under UV light or blacklight! 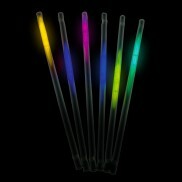 A vibrant colourful glow for your drink, these Glow Straw Cocktail Stirrers are brilliant for parties as the glow travels up and down the straw as your drink. 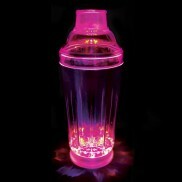 Strobing Cocktail Shaker Mix your cocktails in true 80's style a la Tom Cruise with this fabulous Light Up Cocktail Shaker! 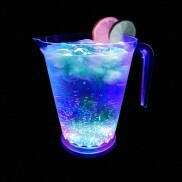 A fantastic nod to the 80's that'll really get your party rocking, and that's before the drinks are even served!